The Old Grey Mare – What's So Funny? Some of you may not be aware of the wide array of Prank Gift Boxes available this holiday season. 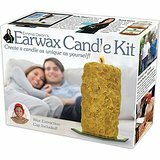 Best sellers include, Turn & Churn, a butter maker that bolts on to your car’s tire, Bacon-Scented Dryer Sheets, and the ever popular Ear Wax Candle Kit (shown below). Too bad they didn’t ask me. I’m sure my line of Pre-Soiled Underwear gift boxes would’ve broken new sales records. Available in a variety of colors and styles, these fabulous unmentionables come straight from the factory with a yellow stain in the front and brown racing-stripe down the back. Scented options include; Pickled Eggs & Beer, Buzzard Breath, and Brown Bean Blowout. If you are new to Friday Flash Fiction, our infomercial host who makes buying gag gifts fun, is Veronica Popeil Wisoff-Fields. To learn how to participate in this weekly exercise in madness, head over to her blog for instructions. To rent a booth in the FFF Hollywood Squares Authors Block click here. He stared at the tasteless, gray matter before him. The gruel stared back—taunting him. “After breakfast, chop a hole in the pond. 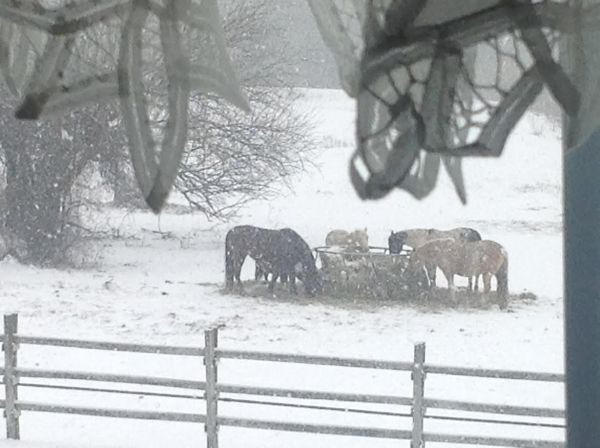 Those horses need water. Feed the chickens, and bust some kindling up while you’re out there,” his mother ordered. “C.E. is coming over today,” Henry mumbled. I’m not sure I’d trust that Scot with my axe. If you do, I’d be watching me back. I nearly spewed coffee through my nose on that one. As long as I’m in the neighbourhood, might I interest you in a handy-dandy curly french fry cutter that doubles as a nose hair shaver? Never leave home without it. Only 19.99. But wait! If you answer this offer within the next five minutes you’ll get a second one absolutely free! And that’s not all!. I’m prepared to toss in an anatomically correct, circumcised tushie planter chia pet. How can you refuse? A bargain at any price. I expect the spry Scot will soon have the old grey Nag on her way to the great glue factory in the sky. That sounds like an excellent product you’re hawking. I love things that slice, dice, and make Julian fries. Will it braid ear hair into leg warmers too? Will I still get a hug? Don’t you come by Shaloming me, missus, or your wee curls could be shorter by the morn. To be accurate, I was shaloming Henry. For you, Mr. Ayr, I’ll keep a wee light burning and wear a helmet. I can guarantee that Henry won’t be troubled any longer by the old harridan once the little, dried-up Scot arrives. It may not be a pretty scene, but it beats your array of Christmas gifts. I’ll pass on the underwear, if you don’t mind. Surely you have a not-so-loved one whom you’d like to endow with such a gift? I’d suggest Kent or Perry, but I believe two or three people have already ordered on their behalf. Don’t drag MY underwear into this, I ordered the earwax candles. Besides, my birthday’s in 6 days and I wanted the circumcised Chia pet. I hear the plant is a you-clipped-us. I suspect the not so week furriginer can hold his own. Better than holding someone else’s. Lovely guest appearance from CE, and very true to form! Ah, you’ve seen his business card – Have Axe Will Travel. Cheers, ma man, richt chuffed am ur tae hae ye oan ma side. Am thinking yin guid plate o’ purritch’ll see aff this hale crew, aye? Note to self: don’t read Russell’s posts while eating/drinking. I suppose you’ll be cracking wise for the holidays; have a joyous time! Maybe, but usually when that happens Connie tells me to pull my pants up. I have to get back to see our Scotsman’s comment on this one… but I have to say I keep my axes under lock and key… (don’t trust myself either). We could have a duel, Bjorn, axes at 2,500 kilometres. Whoa, careful, someone could get hurt. And that is not my style! What do you mean, ‘little, dried-up Scot’? And it will cost you a fair few bawbees for me to blunt ma guid axe on yon auld crone’s heid. Or just one Penny, if you find the right one. You drive a hard bargain, Sir. But the workman is worth his wages, sayeth the good book. Heck! I’m having as much fun reading the before and aft of this tale as I did reading the story itself. CE will have more to say later on I’m fairly sure. I don’t know how we could have more fun without breaking the law. Aye. His reputation precedes him. Just don’t refer to him as “little.” It could be hazardous to your health. You got that right, Michael. I’m sure I’ve seen that “dried up little Scot” around the place. Normally there are police cars and ambulances and coroners not soon afterward. Probably just a coincidence. There’ll be no worrying about the chores once he’s had a dram of Scotch though. I’m sure it’s just a coincidence too. One thing is for certain, following him around is never boring. I can’t help but wonder if CE would have been this disrespected had he remained anelephant? Thanks, Dawn, it seems I am being ‘outed’ on all sides here! AnElephant is not playing this game! Hmm, perhaps I should go by “the walrus” for a while and see what happens. Thank you, Penny. The big, ornery Scot added a whole new dimension to the story, especially the comment section. What a nice testimony on his behalf. How much did he pay you? The comments have far outweighed the story on this one. It’s been a blast. Axe, hammer, knife, rock, rubber hose, piece of rope, shoestring, plastic bag, a dirty sock. The man can create mayhem with even the most innocent item becoming a weapon. He’s extremely talented in that regard. Loved the story and enjoyed the comments too, but I’ll steer clear of the novelty gifts, thanks! Aw, come on, Jen. Just think of the fun you and the kid could have with one of those Ear Wax Candle kits. Five out of five Warp 7’s. Thank-you, thank-you, thank-you, Russell. You should read my Henry Frankenstein dialogue sometime! Plus three for the comments. Oh wow, extra credit too? May I interest you in a pair of fermented socks marinated in in the foot juices of the great unwashed…a teenage boy! These socks walk all by themselves! Looks like there’s about to be another murder here and perhaps Rochelle should be having a body count each week. How many people died in order to produce our weekly offerings? No murders in mine. There must be something wrong with me! Yup, you have a teenage boy, all right. Descriptions like those socks got would make for pretty good insect repellant. I’m not sure. Flies seem to be attracted to dead bodies! There’s nothing like the odor of “Gym Locker in July.” Someone should bottle that stuff. I bet they’d make a fortune. If his socks are that talented, can his underwear be far behind? We’re still a good 5 months away from annual bath time (the month of May) here in the states. Maybe he can train those socks to run errands or take out the trash. If Friday Flash Fiction had a 50 acre cemetery, it would have been overflowing long before now. I reckon the Friday Fictioneers could use his socks to dig a few graves. The dirt would smell them coming and get out of the road. No digging required. He’d love to live in the USA and have an annual bath. The dogs would love it too. I don’t think I could keep up with the body counts, Rowena. As for the marinated socks, one of my boys was really good with that. I had to do his laundry wearing a gas mask. If you axe me, C.E. is just what Henry’s father ordered. I mean, doctor ordered! Nice comedical/macabre tale which obviously connects into psychological connections with your actual life and emotions. I can tell you I’m never going to have the urge to mother you ever again! Perry, you’re getting deep and philosophical again. You know gives you hives and constipation. Be a good boy, or I’ll have to call the nurse and schedule another enema. He has a lot on his mind, hence the enema. I have no axe to grind but I couldn’t get past the designer underwear. I know stained glass is valued but this…. What’s the returns policy? According to what my mother used to preach, you’re not supposed to wear them if there’s a possibility you might be in a car wreck and have to go to the hospital. The return policy clearly states that they must be brought back UNWASHED if you want a refund or exchange. Gasp-I’m all out of breath after laughing my way though the comments and the story. There is no messing with that Scot. I’d be afraid. Hilarious, Russel, and what a party you’re having here. I’ll pass on the underwear but would take that Julian fries cutter. I’d send it to the Equadorian embassy in London. Yes, the Scot brought out an onslaught of comments. It’s been a hoot this week. 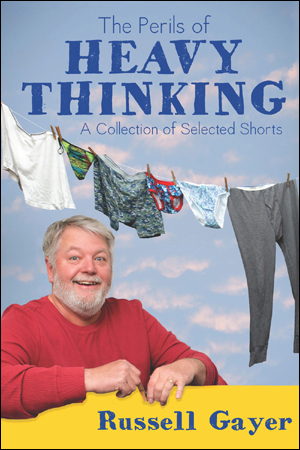 The underwear are also available in the thong variety, if that’s your style. I think the Julian fries cutter is currently out of stock due to popular demand. From what I hear, they’re being sent to Ecuadorian embassies all over Europe. Ack, misschpelled it, didn’t I? I’ll pass on the thongs, thank you very much.